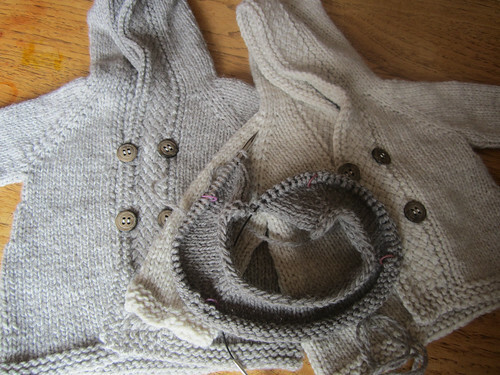 I am finished with the second Latte Baby Coat and have started the third one in the largest size. 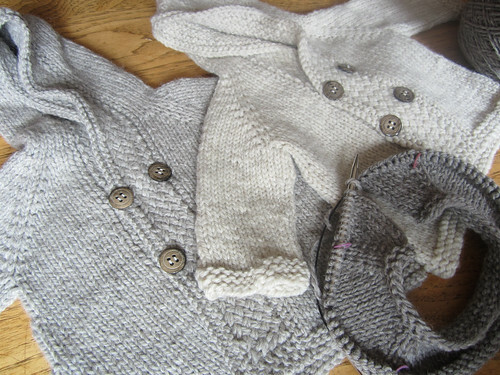 I am making this one without the hood since my daughter said that my granddaughter won’t wear a hood anyway. It is cute with the hood but I am hoping I will like the hoodless version too. I debated with myself, yes I do that, about modifying the neck to do front neck shaping, using short rows to build up the back neck, but I ended up not doing that after all. I figure that maybe having the neck higher in the front will be a benefit to blocking drafts since it is an outer garment. I like the way this Cascade Eco Wool washes up after it is knit. These sweaters are cushy and soft. I like the natural colors too. It’s a nice change.